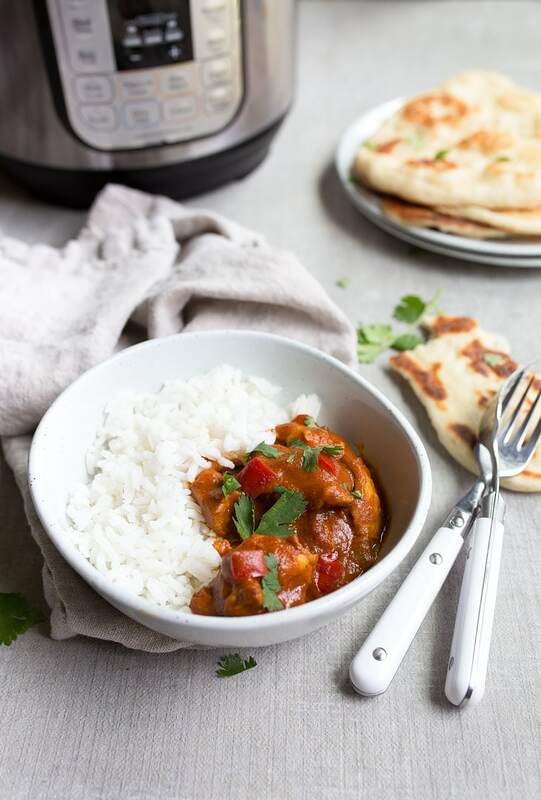 Instant Pot Butter Chicken recipe–a creamy, tangy chicken recipe with Indian spices made in the instant pot. 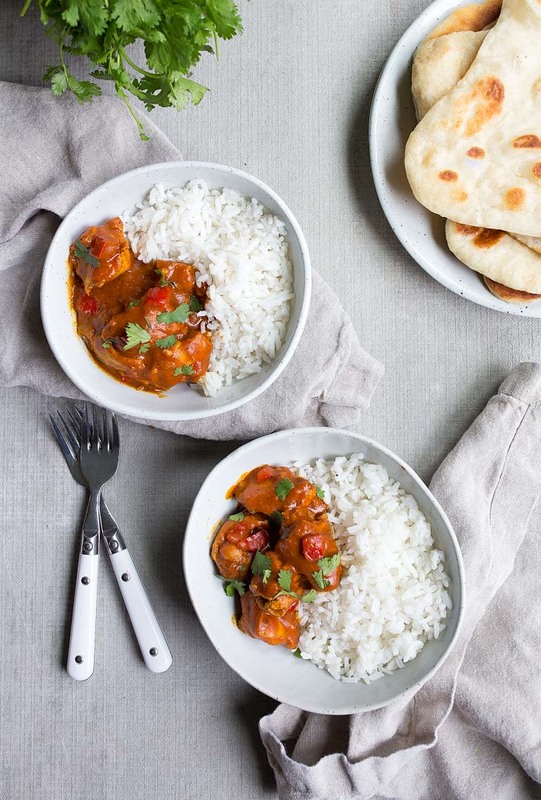 Serve this Butter Chicken over white rice and a side of naan bread, and enjoy. 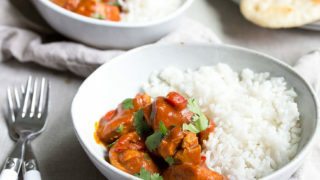 If you love this Instant Pot Butter Chicken, be sure to check out all of my Instant Pot Mini recipes. Can we talk a bit about food budgets? I just wrapped up final recipe testing for cookbook #4, and took a quick look at my books. On average, I spent $100 every 3 days at the grocery store for 4 months. And honestly, that was just the last round of recipe testing; I don’t have the heart to go back and track it beyond 2018. This latest book was 2 years in the making, and it’s a blessing that I had so much time to work on it. If you’re wondering: it will be more dinners for two with a release date of April 2019. I’ll keep you updated: here’s the pre-order link. It’s not that the book contains complicated recipes that have long ingredient lists (you know from my book Sweet & Simple that I’m a 10-ingredients or less kind of cook). It’s that I made everything at least 3 times, and I’m a chronic over-buyer. I buy a bunch of cilantro and parsley every time I step in the grocery store, just in case the one in my fridge isn’t perky enough for food photography. I came out of the experience with an overstuffed freezer, a fridge full of food, and an overflowing pantry. (And then I landed right in ‘book edits land’, which is its own level of hell; ask me in 5 years and I’ll tell you the story of this book). I’m currently playing Grocery Games with myself each night, and coming up with recipes to use everything I have on hand. I’ve only been to the grocery store twice this month, and it was for toddler basics (Camille needs these 3-ingredient pancakes like I need coffee every morning). With a small bag of frozen boneless chicken thighs, a messy spice rack, and partially full containers of heavy cream littering my fridge, I made this instant pot butter chicken in my instant pot mini. Chicken thighs are absolutely the way to go when it comes to the instant pot because they stay moist. I used chicken breasts in my Instant Pot Salsa Chicken, because the starch from the rice helps with moisture in the pressure cooker. When I make Instant Pot Chicken Stock, I use bone-in skin-on thighs. Oh, and my Instant Pot Chicken and Dumplings also uses chicken thighs. When it comes to chicken, I’m an instant pot chicken thighs kind of girl it seems! There are a lot of recipes for instant pot butter chicken on the internet, and they’re mostly too watery. Even though I closed the lid on thick tomato sauce barely clinging to cut up chicken thighs, I always opened the lid to a watery sauce. As a result, I eliminated the canned tomatoes, chicken broth and water commonly used in this recipe. I still thicken my final sauce with a bit of cornstarch, but it’s entirely optional now. 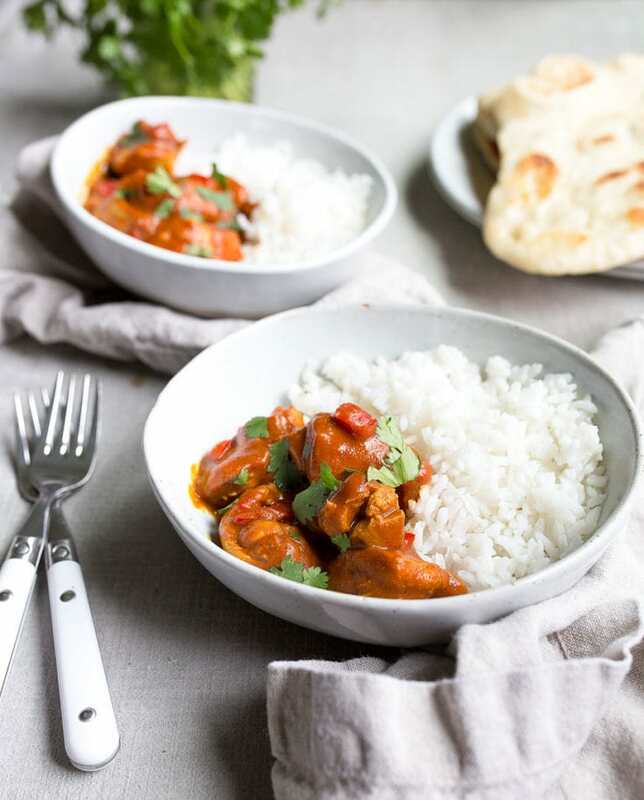 Serve this Instant Pot Butter Chicken with chopped fresh cilantro, basmati rice, and a side of warm naan bread. If you have a minute to brush the naan bread with melted butter and finely chopped garlic, even better! Instant Pot Butter Chicken made so fast! Add the butter to the pot, and let it melt. Next, add the diced onion and bell pepper, and stir to coat. Using a microplane, grate the garlic and ginger into the pan, and stir again. Add all of the spices (garam masala, turmeric, paprika, cumin, and salt) and stir. Add a dash of cayenne pepper if you want it spicy. Stir everything in the pot together very well, and then turn OFF the Instant Pot. Add the tomato sauce and chopped chicken thighs to the pot. Stir to coat everything. Next, press 'PRESSURE COOK' on the Instant Pot, and toggle to 'HIGH.' Place the lid on the Instant Pot, turn the dial to 'Sealing,' and set the timer for 10 minutes. Once the pot comes to pressure, the 10-minute countdown will begin. Consult your Instant Pot manual for any troubleshooting. When the 10 minutes is up, do a 'forced pressure release' by covering your hand with a thick kitchen towel, and turning the sealing valve to 'venting.' Be careful--lots of steam will pour out of the valve. When the pressure is done releasing, the float valve will drop, and it's safe to open the lid. Meanwhile, whisk together the heavy cream and cornstarch very well. Remove the lid from the Instant Pot, and stir in the heavy cream and cornstarch mixture. Let the mixture thicken a bit with the residual heat, and then serve over white rice and with chopped cilantro on top. Oooo!! Another book!!! Can’t wait!!! Thanks so much for this recipe! Excited to try this as I’ve also found other recipes to be still too watery for me too. This may be a silly question: you don’t have any problems with a burn warning with only having tomato sauce in there with everything? I’ve cooked a lot with my instant pot, but haven’t had tons of experience with certain things still, though recently I did have my first incident with a burn signal when I was cooking something with tomato sauce I think. Oh no, Thu! I’ve actually never seen the burn warning with mine. I’ve never tried to cook tomato sauce by itself, though. Tomato products by themselves are too thick to make the pressure cooker come to pressure. If you tomato products with enough thin liquid like water or broth to bring your pot to pressure you should avoid getting burn notice. You could also do pot in pot. That being said trust Christina. Her recipes are always spot on. Are you using an Instant Pot mini, or the regular one? I’ve never had any issues with this recipe. Are you using an Instant Pot mini, or the regular one? I desperately want to make this, but don’t have an instant pot, nor the budget for one. How would you recommend changing it to work for a slow cooker?? I actually even have a small one! I like to eat butter chicken, it would be very delicious when combined with white rice! Will deinifitely addapt this receive to my dutch oven!! It’s so funny because this pretty much a regular way to cook chicken on weeknights. I love to cook all kind of things by using different spices altogether and I have to say that even without following a detailed recipe, the result is always really good! whether if it’s indian flavours, asian, greek.. I just never find the time to follow any recipe for dinner! I will definitely read this one closely and use the spice mix you mention in here, as well as all other steps. I’m sure the chicken will come out amazing!! Thanks a lot for sharing. You inspire so much to keep cooking deliciously!! Could you use a 6 quart instant pot for this recipe? Congratulations! I’m so excited about your new book! I pre-ordered!! Patience is not my thing however I know it will be worth the wait. would love to try this but the recipe seems to be missing? I can’t see it anyway, but I can see them on your other posts! Hello! Is this recipe by video only because I don’t see the printable version of it?? Thanks! I’m so sorry, Dorothy! I’m working on fixing this. I switched to a new recipe card plugin that completely ate my recipe :( Ugh! It will be back up soon! Thank you! Made this dish last night. It’s an absolute winner. I have all your books Christina and use them a lot. Making the cheesecake in loafpan tonight. Cheers. Can i dohble this recipe for a family dish? I am going to try it tonight and hope for the best. You can! I doubled it and made it in my small 3-quart Instant Pot. What size Instant Pot do you have? I just bought an Instant Pot and this is the first recipe I tried. My husband said it’s the best meal I’ve ever made. Thanks for putting it up!